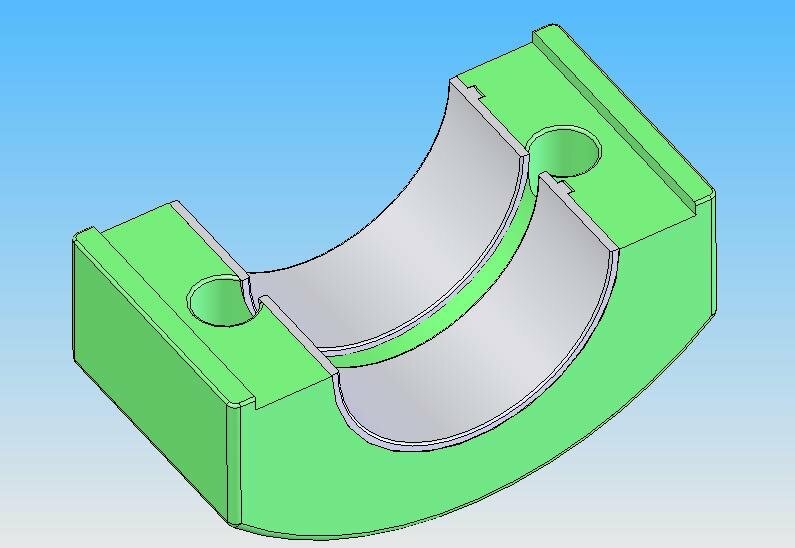 Five main bearing caps are utilized in this redesign. The front and center caps are identical to each other, and the two intermediate caps (between cylinders 1&2, and 3&4) are also identical. The front, center, and rear main each use a pair of bearing inserts. The two intermediate main bearings (between cylinders 1 & 2, and 3 & 4) each use a single insert. All 8 inserts are identical, and are the same bearing inserts used in the connecting rods (Federal Mogul 2020CP, twelve sets required per engine). 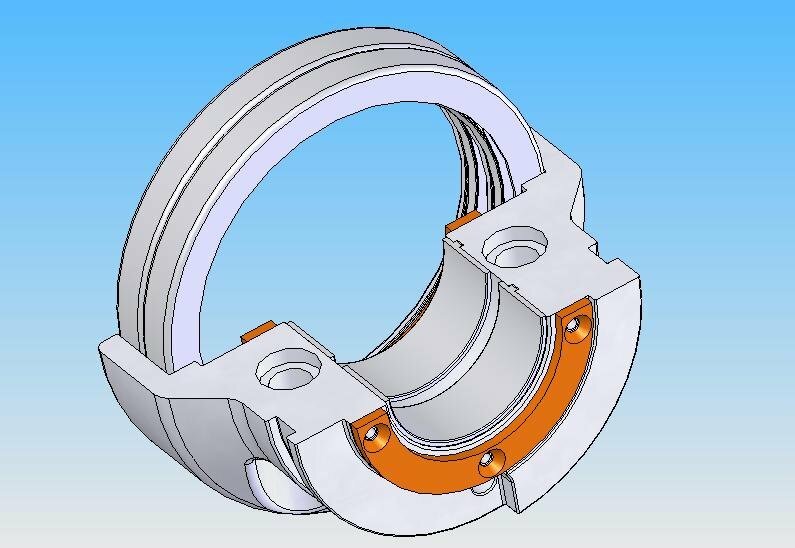 All main bearing insert tang notches are located on the side of the engine away from the valves because the upper main bearing inserts are loaded heaviest when they react peak connecting rod tensile loads. 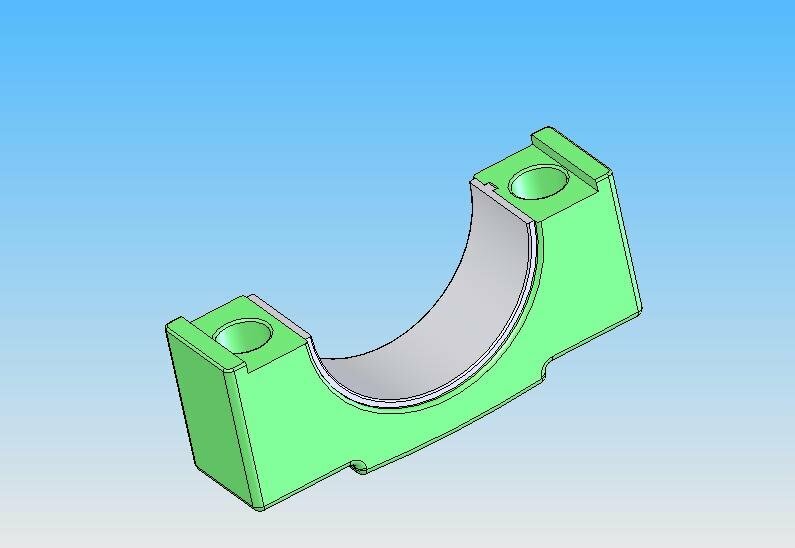 Similar to the design of the new connecting rod cap, the new rear main cap shown in Figure 6 is indexed and fastened with a pair of precision studs threaded into the cylinder block. An o-ring gland is provided around each attachment stud hole to prevent an oil leak. Crankshaft thrust is controlled with a pair of identical bronze thrust washer halves attached with three brass flat head screws (screws not shown). An identical pair these thrust washers is found in the new cylinder block. A pair of 5 inch OD x 4 inch ID x 1/2 inch wide radial lip oil seals (National #415035) are used at the rear and seal against the new wider crankshaft flange. 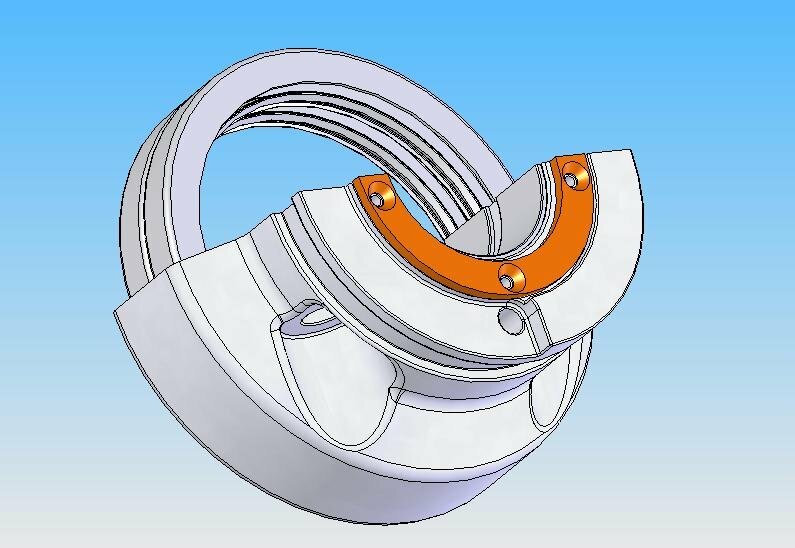 A matching recess is provided in the new cylinder block to hold these double seals. The new rear main cap assembly has the insert bearing halves positioned with a .286 inch gap. This gap between inserts lines up with the drilled oil passage in the crankshaft that provides oil to connecting rod journal 4. This view of the rear main cap also shows the groove for the stock cork pan gasket that is identical in location and dimensions to a stock Model A rear main cap. Located just below the bronze half thrust washer, this view (Figure 7) of the rear main cap shows the drilled passage that vents the rear seal cavity to the crankcase. Also seen at the entrance to this drilled passage is a vertical ledge. When the rearmost crankshaft counterweight passes by that ledge, windage from the counterweight creates a slight vacuum (venturi effect) to help evacuate the seal cavity. It works by using the same principle as the crankcase vent (draft tube) on a pre-smog automobile. The pre-smog draft tube extended to below the engine and was typically cut off at a 45-degree angle. As the car moved, air passing by the draft tube created a very slight vacuum to evacuate the crankcase (venturi effect). The front and center main caps shown in Figure 8 are identical, and include a pair of bearing insert halves with an .188-inch gap between inserts. This gap lines up with the drilled oil passages in the crankshaft that provide oil to connecting rod journals 1, 2, and 3. Note the ledges on the sides of the cap that will index with grooves in the cylinder block to keep the cap aligned. This feature allows the attachment bolts to be loaded in pure tension without having to react bending or shear loads. The two intermediate main caps illustrated in Figure 9 that are used between cylinders 1 & 2, and 3 & 4 are identical and include a single bearing insert. Again, note the ledges on the sides of the cap that will index with grooves in the cylinder block to keep the cap aligned.